Aprofitant l’estrena a la Sala Beckett de Barcelona de l’obra teatral Una hora en la vida de Stefan Zweig, del dramaturg canari Antonio Tabares, que retrata l’última hora de vida de l‘escriptor austríac, just abans de suïcidar-se, hem pensat organitzar una conversa al voltant de la figura i obra de Stefan Zweig amb el director del muntatge, Sergi Belbel, i el traductor de bona part de la seva obra, Joan Fontcuberta. Serà conduïda pel periodista cultural Albert Lladó. Stefan Zweig, Beware of Pity. Stefan Zweig, Letter from an Unknown Woman. Stefan Zweig was born in Vienna to a wealthy Austrian Jewish family and belonged to the city's liberal elite. He published his first book of poems at age 19, and earned a doctoral degree in philosophy from the University of Vienna in 1904. Some of his early essays were published in Vienna's leading newspaper, the Neue Freie Presse, whose literary editor was Theodor Herzl, later the founder of Zionism. Zweig was a lifelong pacifist, and during World War I served in the Archives of the Ministry of War. In 1920, he married Friderike Maria von Winternitz; the couple divorced in 1938. He married Lotte Altmann, his secretary, who was 27 years his junior, as his second wife. 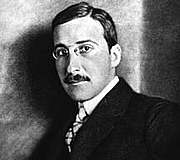 In the 1920s and 1930s, Zweig became one of the most famous and popular authors in the world, producing journalism, novels, novellas, plays, biographies, and works on the history of ideas. He worked with composer Richard Strauss as a librettist for two operas. Following the rise of the Nazi regime in Germany, Zweig went into exile. His books were burned and banned in Germany, but he remained popular in translation. He lived and worked in England for a few years and became a British citizen. However, the advance of the Nazis in Europe prompted him to sail with his wife for the USA, where they settled in New York City in 1940. That same year, they moved on again to Petrópolis, a town near Rio de Janeiro, Brazil. In 1942, the Zweigs were found dead of a drug overdose in their home; he left a suicide note expressing his despair. His autobiography, The World of Yesterday, had just been completed, and was published the following year. Stefan Zweig is currently considered a "single author." If one or more works are by a distinct, homonymous authors, go ahead and split the author. Stefan Zweig is composed of 31 names. You can examine and separate out names.